Dear ones, remember that meditation is a natural state, an experience that allows you to discover your inner being. Through meditation you realize who you are. Through meditation your consciousness shifts. This can be very subtle. You may notice the shift in your everyday activities. Limitations may vanish and you begin to see your own inner light shine brighter and brighter. When you meditate you may feel that nothing is happening. Know however that something is happening. As soon as you start to meditate, your inner being unfolds and the inner spiritual power uplifts you. This power transforms you on many different levels, and through this spiritual knowledge your enlightenment begins. •	Go Within – Always start your meditation with an absolute feeling of conviction to cherish your own divine light. Remember; when you meditate you enter your own being, your own inner heart. •	Cultivate Stillness – When you sit for meditation, do not do anything. Only when all our senses are quiet can we experience Sat-Chit-Ananda (existence-consciousness-bliss). Instead of thinking negative thoughts, breathe the awareness “I AM loved, I AM pure, I AM bliss.” This is the So Ham, the divine breath. •	Discover Your Mantra – A mantra is a set of sacred syllables invoking a divine being, or the name of God. Mantras are unique and powerful. They are words that are infused with divine power that can heal and calm the mind. The mantra is a divine sound, of and from Mother-Father Creator. It may be music, chants, wind, birds, human sounds, water, drumming, toning, or using your breath. Mantras are made of divine letters as well as divine sound. Begin with So Ham – inhale “So,” exhale “Ham”. •	Live and Breathe the Mantra – The power of mantras can transform a being if the right understanding is present. Japa is the repetition of the mantra to bring about union of your mind with the Divine. Do you truly understand, identify with, activate and breathe the mantra you have chosen? Using a mantra consciously is a powerful method of cleansing for your whole being. The more you repeat the mantra, the more it becomes a part of you. Say your mantra as much as possible, the name of God always on the tongue, so that you think only divine thoughts and speak only divine words. When you meditate, step with courage into the unknown. Be silent. Keep your mantra on the breath until you are lost. The mantra will take you to that place from which it comes: the All That Is space where you have no reference. This is where you will find Oneness, Unity, Freedom, Bliss, Love, Light and Real Life. As experiences come to you while meditating, do not be attached to any of them. Many colors of light will come. Go beyond them also. Go to that place where there is no thing, nothing. This is the place. Meditate on the divine. Pure Love is divine Love, God's Love. God's Love is grace and power. God's nature is Love and compassion. God “all ways” looks at you with eyes of Love. Be God. Look at others and yourself with eyes of Love. God is pure. Self is pure. This purity is inside each of you, no matter who you are. Meditate on that purity, on that divinity, and you will be permeated by that which you meditate on with Love. Make an effort, and you will find the treasure. You carry your Higher Self with you wherever you go, so it is very easy to meditate on that. Wherever you are, meditate. Freedom and liberation lie in meditation. It is the only place where you can master your mind and actually meet yourself. People often tell they are happy because they are in love with X or Y. It lasts a few days, weeks or months, and then they are sad. I suggest instead that you be in Love with life in its fullness. Be in Love with life and you will never be sad. To experience that state in its fullness, be still in body and mind and meditate. Within you will find the tremendous power of Love and an ocean of bliss. 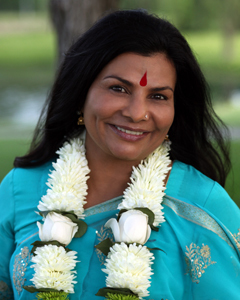 Sai Maa is an international spiritual master, healer and leader of humanitarian efforts. She inspires and energizes people worldwide through Sai Maa Diksha (pure light blessing). With her unique combination of Eastern spiritual wisdom, Western therapeutic knowledge and maternal love, Sai Maa shares lessons to uplift humanity and help people master their own lives as she has mastered hers. Sai Maa has published two books, Petals of Grace: Essential Teachings for Self-Mastery and Points of Light. Learn more at http://www.sai-maa.com.